Another book from the best seller cookbooks series:"A Culinary Journey - a journey between landscapes and recipes"
Greece - amazingly diverse country offers its visitors a whole world: ancient cities, archaeological sites worldwide importance, impressive monasteries, green mountains, forests and streams of water, picturesque villages, sunny beaches and beautiful islands. Simple, easy and absolutely delicious! I want to take you on a culinary journey through recipes and landscapes that will give you a deeper glance on Greece with The 50 best recipes of the region, gathered especially for you. 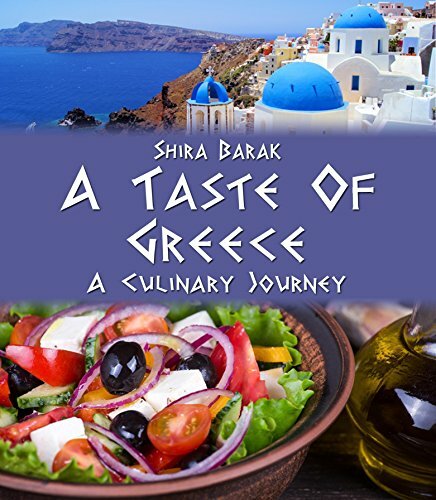 This is not a regular cookbook; In this book I will try to introduce you briefly the history and culture of Greece and especially the principles of the Greek cuisine. Through the recipes and the beautiful pictures of the dishes and landscapes, I hope you can feel for a moment as though you are now seating at a small charming taverna, listening to the sounds of bouzouki and with a glass of ouzo, enjoys all the great dishes served in front of you ... Yasu! Wishing you a delicious and spiritual journey.